The poster illustrates UFO as an all night event. It expresses the half light of dusk and dawn and the sense of time between as floating and fluid, with a subtext that the night belongs to ‘Trippers’ as the day belongs to ‘Greys’. 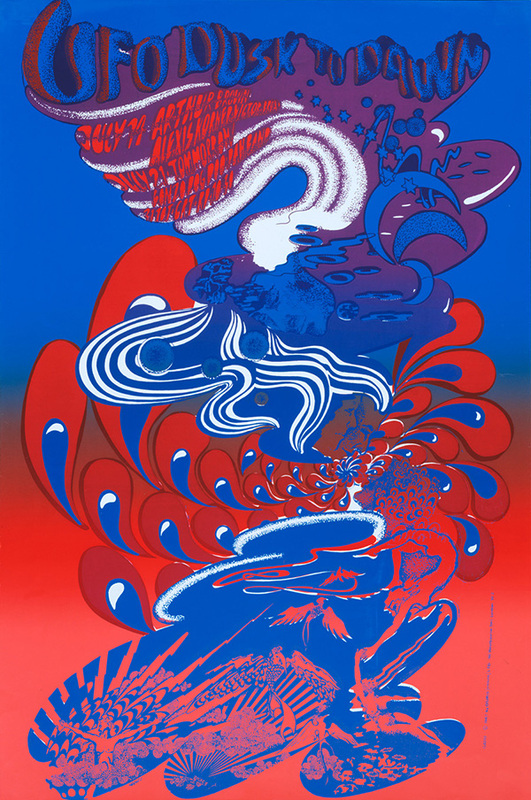 The poster was commissioned by Joe Boyd’s Osiris Visions poster company for the July 14 performance of Arthur Brown and Alexis Korner and July 21 performance of Tomorrow and the Bonzo Dog Doo Dah Band. Placing separate inks on one screen for a single pull produced the rainbow effect and a rich colour look for little expense.